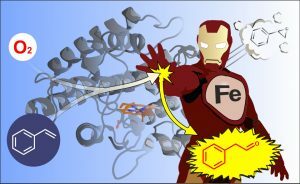 First carbon-silicon bond-forming enzyme! Kan et al., Science (2016). doi: 10.1126/science.aah6219. Huge congratulations to Jenny Kan (postdoc), Rusty Lewis (grad), and Kai Chen (grad) on winning the 2016 $10,000 grand prize Dow-Sustainability Innovation Student Challenge Award (SISCA).